Many birders say the Golden-winged Warbler is their favourite warbler. The species name chrysoptera is Ancient Greek for "gold wing". The Carden Alvar is a great spot to hear and see this attractive but vanishing warbler on its breeding grounds. HYBRIDS: Golden-winged and Blue-winged Warblers hybridize freely. First-generation hybrids are called “Brewster's Warblers” because they were originally considered a separate species. Second and succeeding generation hybrids show variations of both species, including a rare phenotype called the “Lawrence’s Warbler”, also once considered a full species. In most locations where both species persist and interbreed, Golden-winged characteristics generally become “genetically swamped” by Blue-winged characteristics. Thus, over time in one location, all birds will appear to be Blue-wingeds even though many may have Golden-winged ancestry. 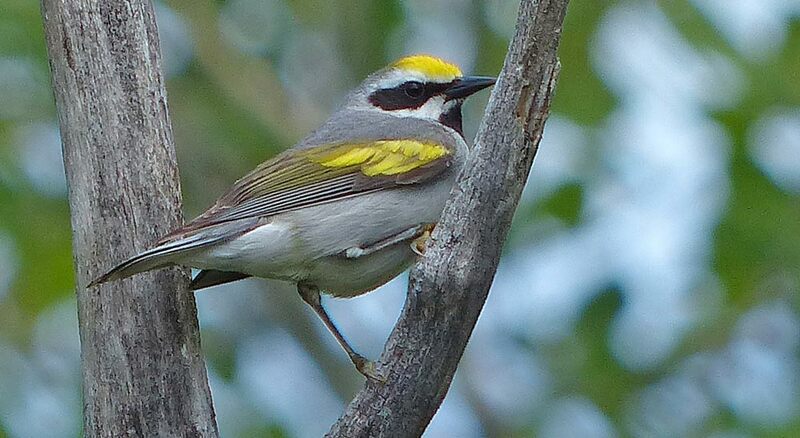 Blue-winged Warblers and hybrids are increasing in Carden. SONGS: The primary song of the Golden-winged Warbler is a buzzy BEE-buz-buz-buz song. The Blue-winged’s primary song is a wheezy Beee-Bzzz. Both species also have secondary buzzy songs that are difficult to distinguish. Both species and hybrids can sing any of the parental songs. Hybrid songs are not intermediate in form. The Lawrence’s Warbler in Carden in 2018 sang like a Blue-winged. HABITS: Singing Golden-wingeds often perch in full view on a high bare or dead branch. The male's black mask and bib combined with its habit of feeding upside down give it a chickadee-like appearance. The black is replaced by grey in females. HABITAT: Golden-winged Warblers nest in dry or moist early successional scrubby habitats such as poplars or alder thickets bordering woodlands that are used for foraging. Dead trees are important singing posts. CONSERVATION STATUS: The Golden-winged Warbler is listed as Threatened in Canada by the Committee on the Status of Endangered Wildlife in Canada (COSEWIC). Hybridization is considered the main threat. Another threat is the loss of breeding habitat due to forest regeneration. Habitat management that mimics natural disturbances, such as periodic cuts and prescribed burns, is needed to set back succession. BEST PLACES: Do you daydream about hearing and seeing Golden-winged Warblers on the breeding grounds? Reliable spots are Wylie Road just south and just north of the Sedge Wren Marsh. Also search other quiet roads on the Carden Alvar and nearby southern edge of the Canadian Shield. Golden-wingeds are early migrants and are on their breeding territories by mid-May. The best time to hear and see them is mid-May to mid-June. ACKNOWLEDGMENTS: I thank Michel Gosselin and Emily Rondel for information and proofing, Terry Whittam for information, and Jean Iron for the photo.